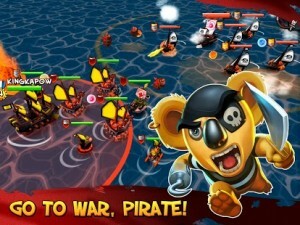 Tropical Wars : Battle rival pirates, build your island, raise an army of warships, and rule the sea! Tropical Wars is a free action-packed strategy game where you lead your pirate fleet to victory. Your koala tribe is under attack and need your help. Are you ready for off-the-hook battles? Improve your island, ships, units, powers, and rule the sea! While Tropical Wars is completely free to play, some in-game items such as extra moves or boosts will require payment. You can turn off the payment feature by disabling in-app purchases in your device’s settings. Thanks Bob ! We’ll look into those animations! This game is great It’s a differnt type of game than I’m used to playing but it’s a good differnt. It’s not like all those other games that use drones and stuff, I really like the whole pirate thing. awesome game ! the fights are awesome No take turns to attack bulls… you guys have done well. game is fun and full of life.